Last week, my daughter and I went to a nature class at the local wild refuge to learn about spring. went outside to look for the signs of spring. 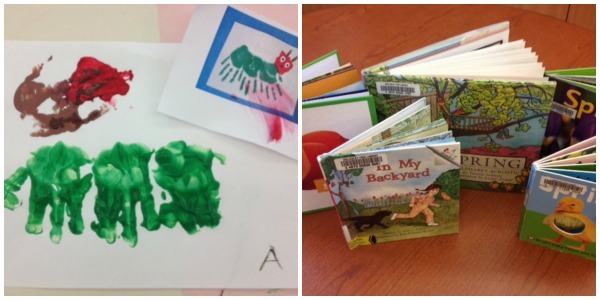 Combining art, nature, and literature is a great way to learn about a new concept. Another fun way to celebrate spring is through movement. Try acting out this spring yoga story below with your children! 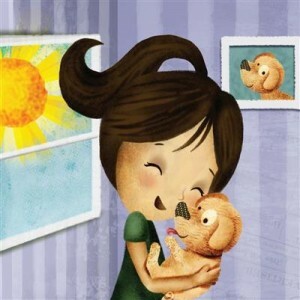 You can read and act out the following yoga story with your children indoors or outdoors. Just clear a space, get out your spring-related props, put on spring-themed music, go barefoot, and wear comfortable clothing. The yoga poses are listed at the bottom of the page, along with a printable version that your children can illustrate themselves. “AAhhhhhhh.” Rachel took a big stretch. She stood at her bedroom window and basked in the rays of the bright-yellow morning sun. “Let’s go outside to play in the garden, Sammy!” said Rachel to her little dog. She scooped him up in her arms. “See you later, Mom.” Her mom sent her off with a friendly wave. Rachel and Sammy skipped around the backyard. It started to lightly rain. The sky was a gorgeous blue. They huddled under the branches of a tall, luscious green tree. Rachel looked up and felt the sprinkles of rain on her face. She smelled the fresh air. Rachel went over to the garden bed. She squatted down and began to plant seeds in the brown, wet soil. “Wow! Getting my hands dirty is so much fun. I love playing in the garden!” said Rachel happily. “Pretty soon, we will see the flowers grow,” Rachel explained to her little dog. She spaced the pink flower seeds two inches apart. The rain stopped sprinkling. “We have to plant lots of colorful, fragrant flowers to attract the yellow bees,” Rachel said. “We need bees to help our vegetable garden grow!” Sammy listened obediently and wagged his tail. “Oh, silly Sammy.” Rachel giggled. 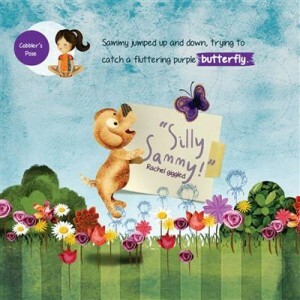 Sammy jumped up and down, trying to catch a fluttering purple butterfly. Rachel saw something orange on a fern leaf. She leaned over and peered at a wiggling caterpillar. “Caterpillars can be pests in the garden,” Rachel said. “They eat leaves, but they are so beautiful.” Sammy barked in reply. My daughter in a caterpillar pose. 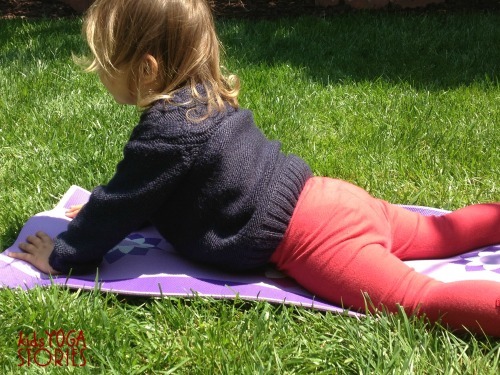 For more spring time yoga poses for kids, click here. 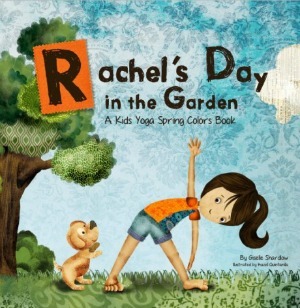 We are so excited to announce the release of our spring yoga story, Rachel’s Day in the Garden. Join Rachel as she and her adorable puppy look for signs of spring in the garden. Crawl like a caterpillar, buzz like a bee, and flutter like a butterfly. Discover spring, explore movement, and learn the colors of the rainbow! This yoga book is the first in our seasonal yoga book series. 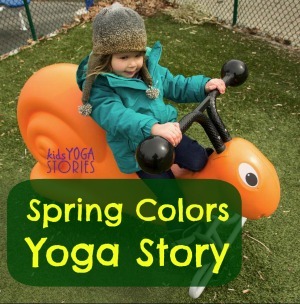 I hope you enjoyed this spring colors yoga story. For more season-related kids yoga sequences, sign up for our weekly Kids Yoga Stories newsletter by adding your email address to the box at the top of the page. 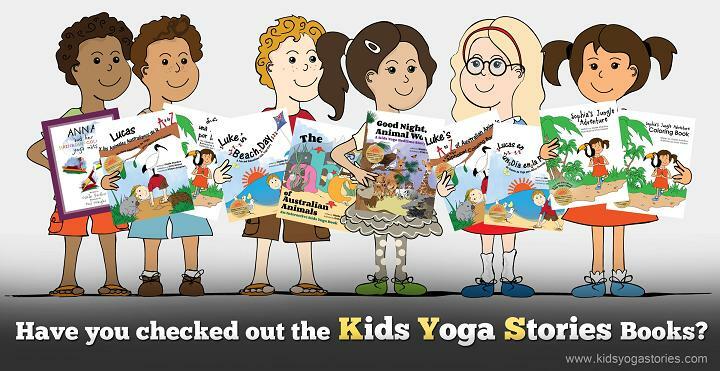 Also, have you also checked out our other yoga stories for kids?